This is a bigger update than usual, with the highlight undoubtedly being the official roll-out of the much-trailed new table and matrix visuals. Renaming fields - at last! For a cumulative list of all of the updates to Power BI Desktop in the last few months, see this blog. Our two-day Power BI Desktop course always uses the latest version of the software. This is described as a new option for a waterfall chart, but IMHO it's a completely different chart type. This shows how the final total sales were reached, year by year (had there been any negative contributions - years in which sales fell - these would have appeared in red). 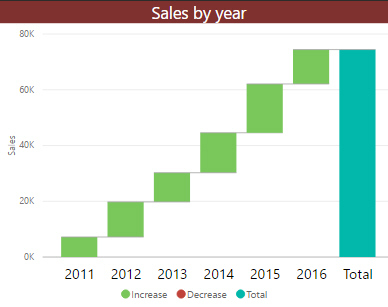 The breakdown feature allows you to see the composition of the increase or decrease in sales between each pair of years, as the following example shows. Drag the field whose contribution you want to show into the Breakdown area of the field well. 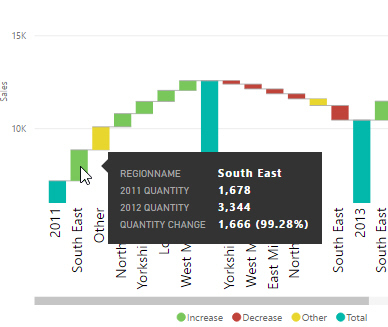 The highlighted bar shows the contribution of the South-East region to the total 2011-2012 sales increase. The South-East region figure for 2012 was 99.28% bigger than the same figure for 2011. 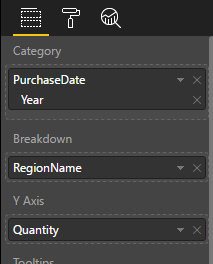 Power BI Desktop will pick out the 5 largest contributors for each inter-year gap (although often one of these will be "all other categories", which by default always appears in yellow). In the Breakdown category of the Formatting toolbar, change the maximum number of breakdown categories. 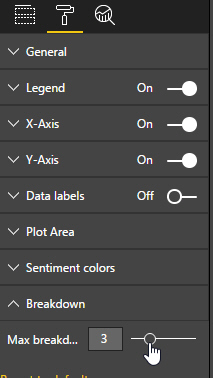 Power BI will always show one more category than the number you choose. Is this a useful chart? I have my doubts - it's a lot of information for a humble human to take in in one go!